The Kenyan athlete Asbel Kiprop, Olympic champion and three times world 1,500 meters, has tested positive for doping control out of competition, according to the British newspaper 'Mail Online'. Kiprop, 28 years old, Olympic champion with only 19 years after the disqualification for doping of the Bahraini Rashid Ramzi, conquered after three consecutive world titles of 1,500, in Daegu 2011, Moscow 2013 and Beijing 2015, and is considered the best middle-distance runner of the last decade. The newspaper does not specify the substance that gave rise to the positive Kiprop but adds that it could be the same as his compatriot Jemima Sumgong, Olympic champion of marathon in Rio 2016, who last November was suspended for four years for consumption of EPO, a synthetic hormone that increases red blood cells and improves muscle oxygenation. The Italian Federico Rosa, representative of Kiprop and many other Kenyan athletes, said he had only heard "the same rumor" and was trying to confirm it, according to the digital newspaper. The manager, also linked to the marathon runner Rita Jeptoo, also sanctioned by EPO, was the subject of an investigation by the Kenyan authorities in 2016, although it did not prosper. Kiprop has denied that he has taken doping substances and has assured that he hopes to prove that he is "a clean athlete in every way". “I have read the information regarding my alleged doping. As an athlete, I have always been at the forefront of the fight against doping in Kenya, a fight with which I am very committed. I do not want to spoil what I have been working on since I participated in my first international race in 2007. 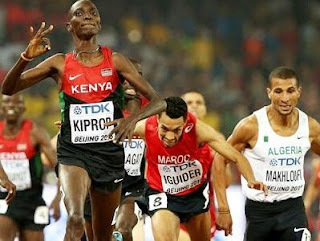 I hope to prove that I am a clean athlete in every way," said Kiprop, 28, one of the greatest figures in Kenyan athletics. If confirmed positive, it would be a new blow to a country that in the last decade has seen its good reputation stained by a cascade of positives that have affected such important figures as the marathoners Jemima Sumgong, and Rita Jeptoo. The positive of Kiprop would come to ratify the new policy of the IAAF under the presidency of Sebastian Coe, of persecution at dilemma of the doping with the creation of the Integrity Unit, even when athletes of much luster like this fall. The name of Kiprop does not appear in the list of exit of the 1,500 meters of the meeting of Doha that inaugurates this Friday the Diamond League in the Qatari capital.